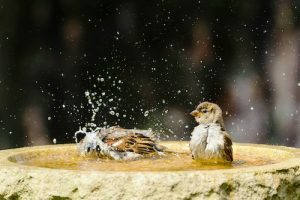 Home Tips & Advice Why Do Birds Need Water? Water is essential for wild birds health. You need to ensure your garden birds always have access to a constant supply of fresh clean water even in winter. 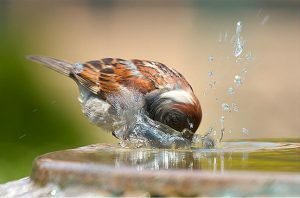 Water is an essential to your bird’s health both for drinking and bathing. Birds need water to keep their feathers in good condition, ensuring they are in good condition helps them with body insulation during those cold winter nights. During the winter don’t forget birds need water to help wash down their food, as diets in winter are usually drier than in the summer when juicy insects are readily available. Many people feed the birds on a regular basis but forget the importance of a ready supply of fresh clean water. Water can be made readily available from a suitable container such as bird baths: these are commercially sold and designed for the purpose. It’s important that the container is regularly cleaned and the water replaced to keep it fresh. But you don’t have to buy special bird baths, water can be offered in any container that is shallow and holds water. Remember that in the winter water can freeze easily so you should break the ice or replace with fresh water daily, to ensure their valuable source of water does not dry up – remember your garden birds rely on you to help them during these cold winter months. Birds are particularly attracted to moving water so garden water features are always a winner when it comes to enticing more birds into your garden. Having a feature with moving water also stops the water from freezing up in those harsh winter months. Use a bird bath in your garden so your birds can drink and bath regularly.